In perhaps one of the final episodes of the ongoing TechCrunch saga has played out this weekend with new editor Erick Schonfeld taking a strong stand against departing writer Paul Carr. Outspoken Englishman Paul Carr, long a controversial figure at TechCrunch, decided to quit the site (as we reported earlier) with a parting post where he alleges among other things of Schonfeld doing the dirty against TechCrunch by agreeing to taking the reigns at TechCrunch in consultation with his boss Arianna Huffington. We won’t reply to what Carr had to say, but Schonfeld has proved in one post that he will be no pushover at TechCrunch, and although his style will be different to that of his predecessor Michael Arrington, he will have his own style and opinion none the less. Paul Carr, one of our columnists who was hired for his grandstanding ways, has decided to fall on his own sword and quit very publicly on TechCrunch. I believe this is the second or third time he’s quit in public in the past couple weeks. I keep losing count. He thinks he is somehow being loyal to Mike and standing up for the editorial independence of the site. But he is not. He is just grandstanding…. At any other publication, Paul would have been fired long ago. And his post would be taken down. But I will let it stand. When Paul was hired, he was promised that he could write anything and it would not be censored, even if it was disparaging to TechCrunch. I will still honor that agreement. He also notes that he is not going to go into the details of what when on behind the scenes in the last few weeks, finally someone at TechCrunch who understands that the constant airing of dirty laundry only continues to harm the site and brand. One thing seemingly overlooked by many who have been saying that TechCrunch will die post Arrington is that the site has been in decline for the better part of the last twelve months anyway. According to Compete, with the exception of a bounce in August (2011), TechCrunch from August 2010 to July 2011 has lost over half of its United States audience. 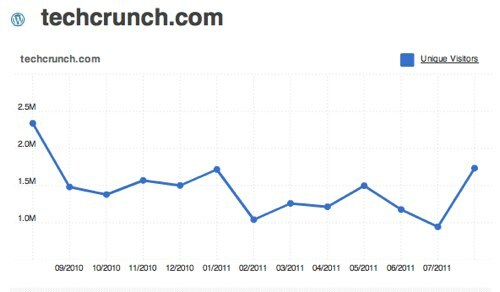 Of note, TechCrunch was acquired by AOL in September 2010, and should have seen strong growth off the back of new traffic being push its way from other AOL properties. But alas: the traffic has gone in the other direction. I’ve met Schonfeld a couple of times, and at the time I wasn’t overly impressed. I was working for TechCrunch when he was first hired, and he struck me as someone who was an old school journalist who didn’t seem to be really be cut out for working at a cutting edge tech blog. But that was the better part of four years ago, and in that time there is no doubt that his modest ways have been transformed by first writing for, and then co-editing TechCrunch; remember if you are a Michael Arrington fan, Schnofeld was his offsider for this time, and there’s no doubting that at least some of Arrington’s positive skills will have rubbed off onto him. The part though, as I read his words, is that the Erick Schonfeld of 2011 has grown the balls Arrington has, but hasn’t lost his overall sense of journalistic ethics. 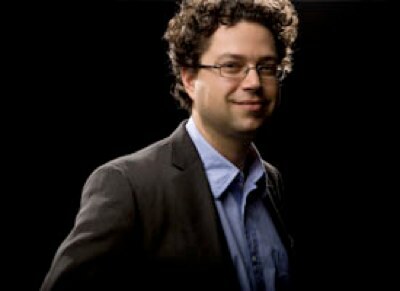 He’s a hybrid leader who presents the skills of both old and new media, and after the scandal and drama that has surrounded TechCrunch in the last few weeks, he may well be the steady, wise hand the site needs to focus again on the task at hand, and more importantly to see the site turn around its traffic woes. Good luck Erick with the new job.